Generally, women don't doubt their ability to conceive until mid-30s, which is the time when initial difficulties come about as fertility rates take a steeper drop, causing them to start paying attention. For most aspiring mothers, fertility after 35 is still sufficient to successfully get pregnant, but there are a number of challenges to take into account. Having a good understanding of how age affects one's ability to have children is, therefore, essential for pre-pregnancy planning. Continue reading to learn more about fertility over 35, including your chances of getting pregnant and factors that can diminish them, so that you can make the most educated decisions about your reproductive health. Why Does Fertility at 35 Decline? Science does not know what causes a faster fertility decline after 35. The fact is that about 10-15 years before a woman goes through menopause, her ovarian reserve starts depleting at faster rates. Ovarian reserve is the ability of the ovaries to provide good eggs that can develop into a healthy pregnancy. It has two important factors, egg count and quality. It is the number of eggs stored in the ovaries, which depletes over time at various speeds. Women are born with about one to two million eggs, which is all they will ever have in their lifetime. At puberty, the egg count is already much lower, about 500,000 eggs. For the next 40 years of menstruation, a woman will lose up to a 1,000 eggs every single month with only one being released on ovulation. When her egg count is totally depleted, she is said to have reached menopause. How Many Eggs Does a Woman Have at 35? Anti-Müllerian Hormone (AMH) levels can be determined with a blood test and reflect how many eggs are maturing in the ovaries. Normal AMH results of women between 35 and 37 are about 2.3 ng/mL; whereas, for those between 38 and 40, they equal 1.3 ng/mL. Antral follicle count is done by a transvaginal ultrasound to view the follicles that develop in the ovaries right before ovulation. Although up to a thousand might be maturing any given cycle, only a small percentage of them will grow enough to be seen on an ultrasound. On average, about 10 visible follicles at 35 indicate a good ovarian reserve. Overall, a woman in her mid-30s is expected to have 100,000 or less eggs in her ovaries. But whether they can grow into a healthy fetus depends on another factor of ovarian reserve, egg quality. It is the DNA composition of the eggs that determine whether they can be useful for pregnancy purposes. Ovarian eggs age just as other cells in the body. Chromosomal abnormalities created within the eggs compromise their viability, including preventing the eggs from being fertilized or implanted in the uterine wall. If pregnancy is achieved with an abnormal egg, it can lead to pregnancy complications, like a miscarriage or fetal birth defects. What is a Woman's Egg Quality at 35? Unfortunately, there are no tests to check the quality of ovarian eggs. Studies have concluded that the percentage of abnormal eggs increases rapidly with age based on observed higher rates of pregnancy complications among women past 35. 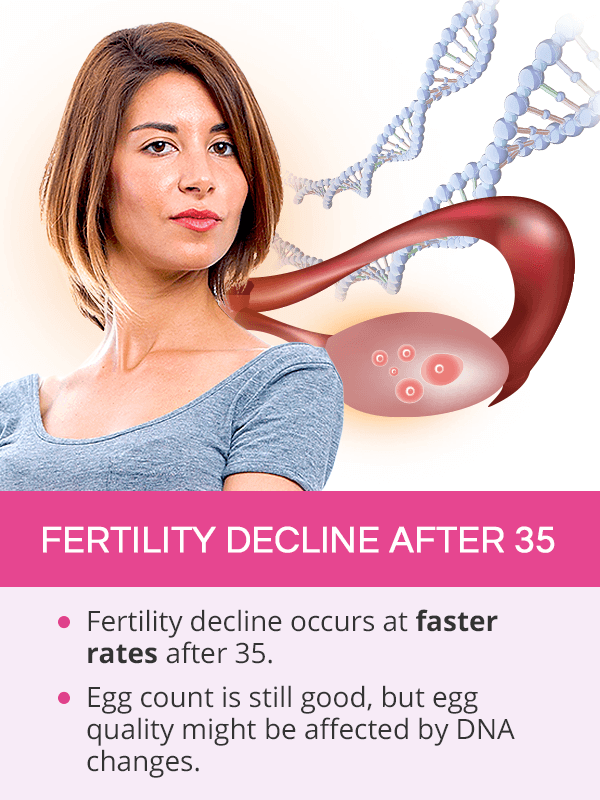 As a result, fertility after 35 often becomes compromised for women. Miscarriage becomes more common as up to 25% of 35-year-olds suffer from it. The rates of genetic conditions, like Down syndrome, rise from 1 in every 1200 pregnancies among 20-year-old mothers to 1 in 350 among those 35 and older. On average, a woman's chances of getting pregnant after 35 in any given menstrual cycle are 15%. At 20-29, there is a 25% chance. At 30-34, there is a 20% chance. At 35-39, there is a 15% chance. At 40-44, there is a 5% chance. It is clear that fertility after 35 declines at much faster rates.In 15 years from the time when a woman is 20 until she is 35, her fertility drops by 10%. However, the same 10% drop is observed in only four years once she turns 35. Overall, it is estimated that 78% of women over 35 do conceive within a year of trying and go on to have healthy pregnancies. How to Increase Fertility After 35? Even though fertility rapidly declines after 35, there are a number of approaches that can help women improve their chances of getting pregnant. Since reproductive health is governed by hormones, maintaining hormonal balance is key to preventing ovulation problems and others that might put further strain of fertility. Good fertility-friendly habits include keeping a wholesome diet with phytoestrogens; taking hormone-balancing supplements, like Macafem; and relieving stress with meditation or yoga. What Options do I Have After 35? 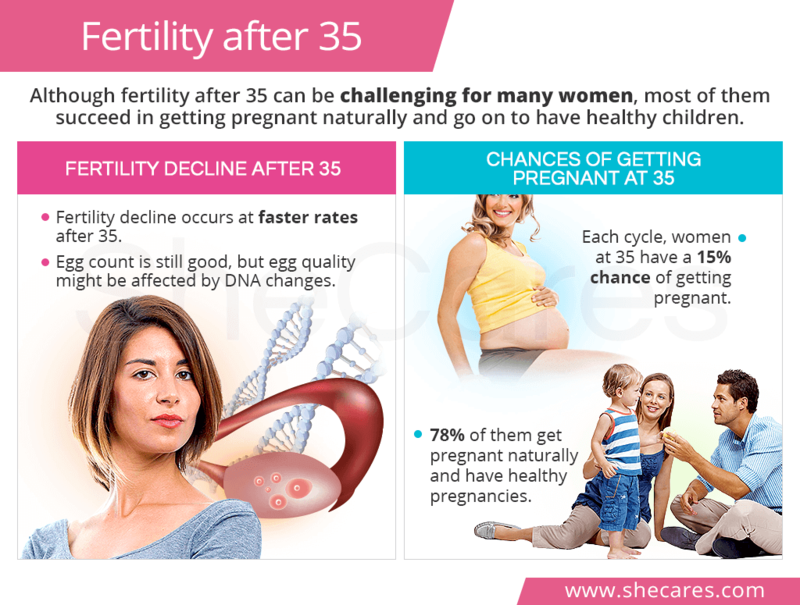 Despite the challenges, woman have numerous options to make the most out of their fertility over 35, whether they want to get pregnant right away or delay pregnancy for a few more years. A woman in her mid-30s who has decided to get pregnant should first attempt to conceive naturally. If she does not get pregnant within six months, the next step is to arrange a consultation with her gynecologist for proper assessments, including undergoing fertility tests. Her options to resolve infertility and get pregnant could include a variety of approaches, such as obtaining hormonal balance, resolving ovulation problems, treating undiagnosed conditions that might be causing infertility, and more. If natural pregnancy is not feasible, she can take advantage of assisted reproductive technologies (ARTs), like artificial insemination or in vitro fertilization. A woman in her mid-30s who wants to delay her pregnancy for later should start by meeting with her doctor so that she understands fertility limitations and can make the best decisions about her reproductive future. One of the options she might be given is fertility preservation, including freezing eggs. It consists of various medical procedures aimed at preserving ovarian eggs so that she can use them with the help of ARTs to achieve pregnancy at 40. Most fertility doctors opt for freezing the eggs no later than at 35 or 36, as older eggs might not be viable for pregnancy. Attempting to get pregnant naturally after 40 is possible, but it presents more obstacles, including miscarriage and birth defects. As a result, most women in their 40s rely on ARTs. Fertility at 35 is far from being finished. Women's ovarian reserve is still sufficient to enable them to conceive naturally and have healthy pregnancies. However, those who wish to further delay motherhood should understand the involved risks. Studies have shown that female fertility after 35 begins to decrease more rapidly with every passing year as more eggs in the ovaries have DNA abnormalities preventing them from being fertilized and developing into a healthy pregnancy. Being educated about the limitations of female fertility allows women to effectively plan their family without compromising their reproductive abilities.